Feng, X., Krukowski, K., Jopson, T. and Rosi, S. (2017). Delayed-matching-to-place Task in a Dry Maze to Measure Spatial Working Memory in Mice. Bio-protocol 7(13): e2389. DOI: 10.21769/BioProtoc.2389. 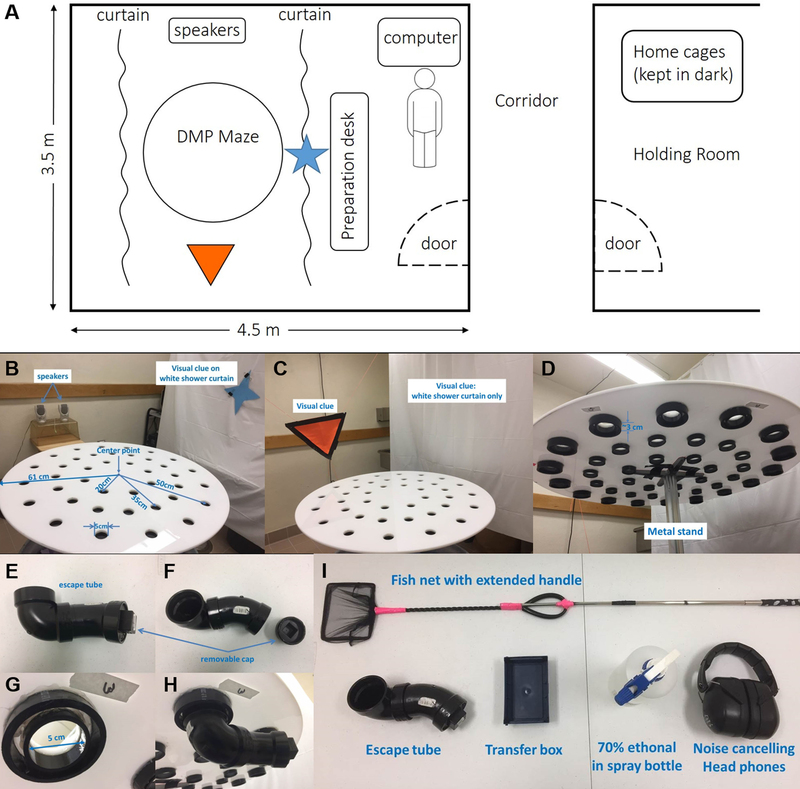 The delayed-matching-to-place (DMP) dry maze test is a variant of DMP water maze (Steele and Morris, 1999; Faizi et al., 2012) which measures spatial working/episodic-like learning and memory that depends on both hippocampal and cortical functions (Wang and Morris, 2010; Euston et al., 2012). Using this test we can detect normal aging related spatial working memory decline, as well as trauma induced working memory deficits. Furthermore, we recently reported that fractionated whole brain irradiation does not affect working memory in mice (Feng et al., 2016). Here we describe the experimental setup and procedures of this behavioral test. The reference-memory water maze (RMW) was originally used to measure spatial reference memory in rats. In this task animals are trained to find a hidden platform in a fixed location under opaque water by using distal clues outside of the water maze (Morris, 1981). Over the years it has evolved into various tasks, that allow probe trials, over training, reverse learning and an on-demand platform (Morris et al., 1982; Morris et al., 1990; Spooner et al., 1994; Lipp and Wolfer, 1998). Later the Morris lab developed a delayed matching-to-place (DMP) water maze that requires frequently updated, ‘delayed’ memory of escape locations in an unchanging environment (Steele and Morris, 1999). These variations of Morris water maze (MWM) are widely used in the neuroscience field to study spatial cognitive functions that involve different brain regions in both rats and mice (Vorhees and Williams, 2006). The main concern for these tests is that forced swimming might induce stress for animals (Vorhees and Williams, 2014). To exclude this limitation, Faizi et al. (2012) designed a dry maze based on the principles of the DMP water maze. The DMP dry maze is believed to measure the same working/episodic-like memory as the DMP water maze with a less intense test paradigm for both the experimenter and test subjects. Note: C57BL/6J male adult mice (3-18 months of age) housed in a room with reversed light cycle for at least two weeks prior to test. Behavior experiment is conducted during the dark cycle (7 AM-7 PM, see Note 1). Note: 16 holes on the outer ring, 16 on the middle ring and 8 holes on the inner ring with distance of 50, 35 and 20 cm to the center of platform, respectively (Figure 1B). ABS tubes (Inner diameter = 52 mm, outer diameter = 60 mm) are attached to each escape hole which allows easy attach and detach of the escape tube (Figure 1D). It is important to use black or dark colored escape tube so mice would prefer to enter. In addition, dark color minimizes the chance of leaving visual clues around escape holes over time. Note: We use a pipette tip box without the lid (Figure 1I). Figure 1. Platform and room setup. A. Sketch of the behavior room and holding room layout; B. A picture showing the details of platform layout and visual clues on two sides of the platform; C. A picture of visual clues on other two sides; D. A picture showing the bottom of platform; E-H. Pictures to show the escape tube, an escape hole and how they are connected; I. Other items needed for the task. Note: Instructions launch automatically when a new experiment is created. Here is a brief description of DMP dry maze experiment setup. In the ‘Arena Settings’ take a snapshot from the overhead camera. Make sure the arena is at the center of camera view, zoom in to maximize the size of the DMP dry maze platform in visible window on the computer screen (Figure 2). Figure 2. Arena, escape holes and calibration setup. The Arena is set to an area slightly bigger than the DMP dry maze platform. The platform diameter (122 cm) is used to calibrate the bit size of recorder videos. Escape holes were changed daily but kept the same for trials conducted on the same day. Use the ‘Draw Scale to Calibrate’ tool in ‘Arena Settings’ to draw a line (scale) to cover the diameter of platform. The scale size is set to 122 cm. Use the draw tools to draw an arena to cover the entire DMP dry maze platform. Draw a circle to cover the escape hole. Circle size can be adjusted by double-click and input the width and height manually. Circle size is set to 7.0 x 7.0 cm. Note: It is important to set the arena bigger than the platform. Setting the arena to exactly the size of platform results in loss of tracking if mouse moves along the edge. In the ‘Trial Control Settings’ define conditions for track start, stop and end (Figure 3). Automatic tracking should start 5 sec after the software detects a mouse. Trial ends after 90 sec of tracking or immediately after mouse enters the escape hole (defined as both the nose-point and center-point of a mouse are in the escape hole). Switch to the ‘Detection Settings’ page; connect the escape tube to the designated escape hole, put a control mouse of the same color and size as test subjects on the platform. Adjust contrast settings to ensure good tracking. Figure 3. Trial control and experimental timeline. A. Recording begins after the experimenter clicks Start before each planed trial. Track start condition is set to ‘cumulative duration over 5 sec when center-point is in arena’. Track will stop after one of the following conditions is met, a) Escaping, defined as mouse ‘center-point is in Escape Target Hole Day N’, b) Time limit, defined as ‘After a delay of 90 sec’. The recording ends immediately after tracking is ended. B. Schematic chart to demonstrate the experimental timeline. One week before the task mice are tail marked and briefly handled by the experimenter every day for 5 days (see Note 2). On each of the test days, mice are placed in the holding room (across the hallway) in their home cage kept in the dark (see Note 3) at least one hour prior to the first trial. Each mouse was habituated for 2 min in the escape tube before beginning the first trial on the first test day (see Note 2). Attach the escape tube to the designated escape hole. Put the mouse in the small transfer box and cover with a red paper towel. Bring it to the test room. Put the mouse on the platform at the center and keep it covered by the transfer box. After a delay of about 30 sec, start recording in the Ethovision software, turn on the tone noise (played at 85 dB, see Note 4) and immediately remove the transfer box to expose mouse in the environment. The experimenter then moves to the recording side of the room and monitors the tracking from computer screen (see Figure 3 for the trial control settings). Wait until the mouse completely enters the escape tube. Stop the tone noise and cover the escape hole with the 3” ABS plug (see Notes 5 and 6). After a 10 sec delay detach the tube, cover it with a red paper towel and put the mouse back to its home cage. Set the timer to count down from 10 min. Clean the escape tube and the platform with 70% ethanol and wipe with paper towels. Start the next trial when the timer counts down to zero. Note: To be more efficient we carried out the experiment in a paired way (Figure 3B). Change the escape hole to a new location (Figure 2) on each of the following test days. Repeat trials using the same procedures as Test Day 1. Note: Escape hole location is kept the same for all the mice on each day. A total of four different locations are used (see Figure 2). Set the analysis profile in Ethovision software, and measure the following parameters: a) velocity of the center-point; b) when nose-point and center-point are in the escape hole (see escape holes in Figure 2); c) Trial control state to cover the period during which trials are active. Extract velocity data of the center-point within each experimental group. Low velocity during trials indicates that the animal either has difficulty in moving or lack of motivation to enter the escape hole. Therefore, all data from the outlier should be excluded from the analysis. We rarely find outlier in the Closed Head Injury (CHI) (Lloyed et al., 2008) and Whole-brain irradiation models (Feng et al., 2016). Pull out the data on ‘Latency to Escape’ defined as the time between trial start and when nose-point and center-point are in the escape hole. Figure 4 shows an example of working memory impairment in animals received CHI. Note: Alternatively, ‘primary error number can be used’. 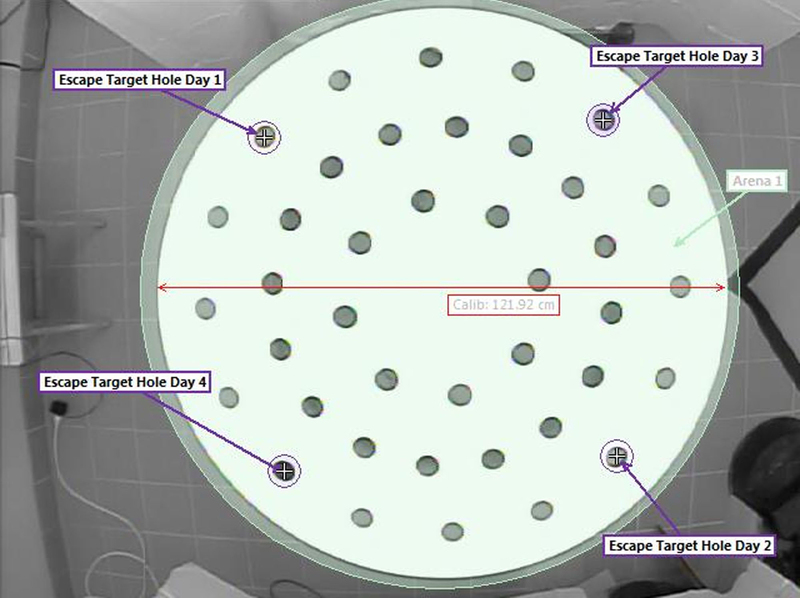 This method measures the number of visit to non-escape holes before the mouse finds the escape hole. Results should have similar trends as those of latency to escape. Figure 4. Working memory is impaired in old mice compared to young (A) and in young mice after CHI (B). A. Young (3 months) and old (18 months) mice have similar performance on day 1 and day 2 but old mice show significantly less trial by trial improvement on day 3 and day 4. B. Working memory deficit were observed in young mice 2 weeks after CHI (mice were 14 weeks old at the time of behavior test). Sham animals show progressive improvement while CHI animals are unable to learn over time (*P < 0.05, **P < 0.01, ***P < 0.001. Statistics: Data were analyzed using two-way ANOVA of repeated measures; P-values are calculated by Tukeys multiple comparisons test). Check the tracking using Ethovision ‘Analysis’-‘Results’-‘Track Visulization’, after clicking the ‘play’ button the software will automatically generate a travelling path for each trial. 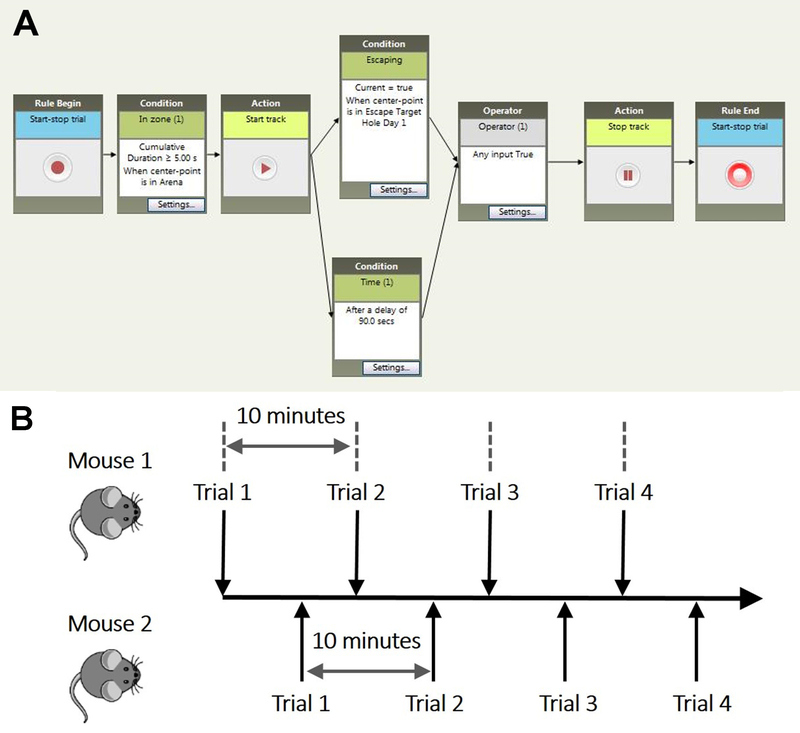 Animals that learned and remembered the escape hole usually have progressive ‘learning’ showed as shorter tracks trial by trial on day 2-4 (Figure 5). Figure 5. Comparison of tracks of sham and CHI animals during DMP dry maze task on Day 3. A sham mouse found the escape hole location on the first trial on day 3 (A), remembered it in the following trials, and entered quickly in following trials (B-D). A CHI mouse did not find the escape hole on the first two trials (E and F), accidentally found it on trial 3 (G) but failed to locate and enter on trial 4 (H). Escape holes are marked in red circles. We choose to perform this task during the dark cycle because mice are supposed to be more active and more sensitive to strong light exposure. Handling mice before experiment eliminates anxiety caused by the experimenter. Our experimental procedure requires a short travel between two separate rooms. Mice are carried to the maze in a small box covered by a piece of red paper towel before a trial. Upon completion of each trial mice are carried back to their cage in the escape tube. Therefore, during the handling the experimenter would pick up the mouse, put it in the box, cover with a red paper towel, walk around and put it back to its home cage. In addition, each mouse is habituated in the escape tube for about 2 min before the beginning of the first trial of test day 1. The experimenter picks up a mouse, lets it climb into the escape tube, covers it with a piece of red paper towel, hold it still for about 10 sec, walks around and puts the mouse back into its home cage. In principle, the handling is designed to allow the mice to get familiar with the experimenter and the trial procedures. Protecting the holding cages from light is essential as strong light provides aversive environment and motivation for mice to enter the escape tube. Pre-exposure to light can weaken this response. Similarly, tone noise during the trials must not be heard in the holding room. While shorter habituation time (e.g., 20 or 30 min) is also used in behavior assays, we have always allowed one hour to further minimize stress. The longer habituation does not affect test results in our hands. Prolonged exposure to loud noise is considered hazardous to humans. Noise Cancelling headphones or ear plugs are necessary. On the first day of trial one, some mice might not find the escape hole/tube in 90 sec. If this happens the experimenter should use the fishing net to gently guide the mouse to the escape hole and let it enter the escape tube by tabbing around the mouse with the tone noise on. A mouse might show hesitancy to enter the escape tube during trials, shown as poking its head into the tube with its palms at the edge of the escape hole, and part of the body leaning towards in the escape tube without fully entering. This might happen on test days 3 and 4 (about 3% of total trials), which could be caused by hind limb problems (occasionally seen in CHI models), anxiety or lack of motivation (animals get used to the test environment on latter test days). Software might continue tracking when the mouse moves away. However, the trial should be re-analyzed to correct the latency to escape. See an example in Video1. The test mouse finds the escape hole without entering; it leaves and comes back again. The trial is manually ended when the head fully enters the escape hole for the first time. Ethovision settings can be adjusted to account for this possibility. This can also occur if there are mobility problems with the animal and entry into the tunnel is painful or difficult. In this case, the animal should be excluded for subsequent testing. If this is found to happen more regularly it may help to handle the animals longer, habituate them longer to the escape tube. This protocol was used in our previous study to measure working memory performance in mice (Feng et al., 2016). This work was supported by NIH grants R01 CA133216 and R01 CA213441 to SR.
Euston, D. R., Gruber, A. J. and McNaughton, B. L. (2012). The role of medial prefrontal cortex in memory and decision making. Neuron 76(6): 1057-1070. Faizi, M., Bader, P. L., Saw, N., Nguyen, T. V., Beraki, S., Wyss-Coray, T., Longo, F. M. and Shamloo, M. (2012). Thy1-hAPPLond/Swe+ mouse model of Alzheimer's disease displays broad behavioral deficits in sensorimotor, cognitive and social function. Brain Behav 2(2):142-154. Feng, X., Jopson, T. D., Paladini, M. S., Liu, S., West, B. L., Gupta, N. and Rosi, S. (2016). Colony-stimulating factor 1 receptor blockade prevents fractionated whole-brain irradiation-induced memory deficits. J Neuroinflammation 13(1): 215. Lipp, H. P. and Wolfer, D. P. (1998). Genetically modified mice and cognition. Curr Opin Neurobiol 8(2): 272-280. Lloyd, E., Somera-Molina, K., Van Eldik, L. J., Watterson, D. M. and Wainwright, M. S. (2008). Suppression of acute proinflammatory cytokine and chemokine upregulation by post-injury administration of a novel small molecule improves long-term neurologic outcome in a mouse model of traumatic brain injury. J Neuroinflammation 5: 28. Morris, R. G., Garrud, P., Rawlins, J. N. and O'Keefe, J. (1982). Place navigation impaired in rats with hippocampal lesions. Nature 297(5868): 681-683. Morris, R. G. M. (1981). Spatial localization does not require the presence of local cues. Learn Motiv 12:239-260. Morris, R. G., Schenk, F., Tweedie, F. and Jarrard, L. E. (1990). Ibotenate lesions of hippocampus and/or subiculum: dissociating components of allocentric spatial learning. Eur J Neurosci 2(12): 1016-1028. Spooner, R. I., Thomson, A., Hall, J., Morris, R. G. and Salter, S. H. (1994). The Atlantis platform: a new design and further developments of Buresova's on-demand platform for the water maze. Learn Mem 1(3): 203-211. Steele, R. J. and Morris, R. G. (1999). Delay-dependent impairment of a matching-to-place task with chronic and intrahippocampal infusion of the NMDA-antagonist D-AP5. Hippocampus 9(2): 118-136. Vorhees, C. V. and Williams, M. T. (2006). Morris water maze: procedures for assessing spatial and related forms of learning and memory. Nat Protoc 1(2): 848-858. Vorhees, C. V. and Williams, M. T. (2014). Assessing spatial learning and memory in rodents. ILAR J 55(2): 310-332. Wang, S. H. and Morris, R. G. (2010). Hippocampal-neocortical interactions in memory formation, consolidation, and reconsolidation. Annu Rev Psychol 61: 49-79, C41-44. How to cite: Feng, X., Krukowski, K., Jopson, T. and Rosi, S. (2017). Delayed-matching-to-place Task in a Dry Maze to Measure Spatial Working Memory in Mice. Bio-protocol 7(13): e2389. DOI: 10.21769/BioProtoc.2389.